"[The Islamist party's] purpose is to conquer the world, not just have a mandate. Its mechanics were already established.... Islamists took power in the name of democracy, then suspended democracy by using their power.... Convert the clothes, the body, the social links, the arts, nursing homes, schools, songs and culture, then, they just wait for the fruit to fall in the turban... An Islamist party is an open trap: you cannot let it in. If you refuse it, your country switches to a dictatorship, but if you accept it, you are at risk of submission...." — Kamel Daoud, Algerian writer, in Le Point, 2015. 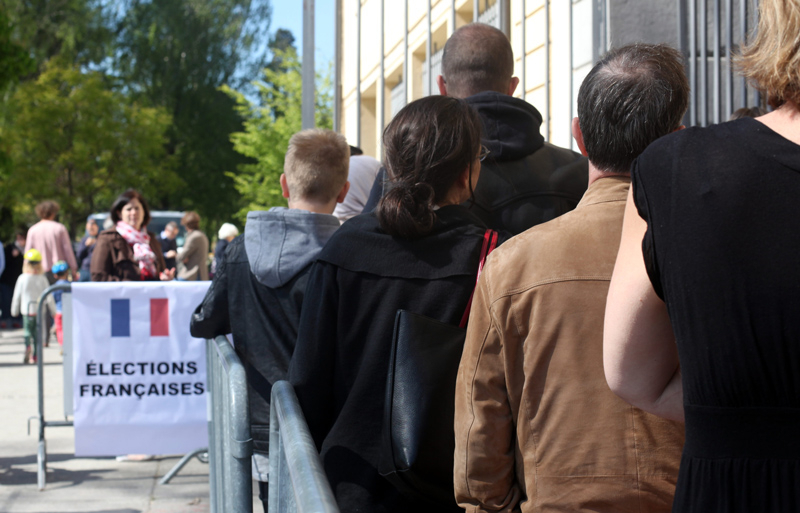 In the legislative elections that will take place June 11 and 18 in France, political parties are finalizing preparations: choosing their candidates, and printing posters and stickers. Business as usual? Not really. One newcomer arose in the political spectrum: a Muslim party, the Parti Egalité Justice ("Equality and Justice Party"; PEJ). What is notable is that PEJ is an element of a network of political parties built by Trukey's President Recep Tayyip Erdogan and his Justice and Development Party (AKP), to influence each country of Europe, and to influence Europe through its Muslim population. The PEJ was created in 2015 in Strasbourg, the de facto capital of eastern France, on the border with Germany. PEJ has already approved 68 candidates -- not enough to cover the whole territory but enough to compete efficiently in districts where Turkish and Muslim populations are strongly represented. French citizens of Turkish origin are estimated to represent 600,000 people in France, out of a Muslim population estimated at 5-15 million, but official statistics do not exist. Another Muslim party, "Français et Musulmans" ("French and Muslims"), is also quietly preparing to erupt on the political scene of the French legislative elections. "Français et Musulmans" originates from L'Union des Organisations Islamiques de France (UOIF) which has been rebaptized "Muslims of France". "Français et Musulmans" is the French branch of Muslim Brotherhood. The PEJ, is the first party in France established by Turks. PEJ already participated in elections of the Provincial General Assembly in March 2015, but was eliminated in the first round. According to the magazine Marianne: "PEJ is closely connected to Council for justice, equality and peace (Cojep), an international NGO which represents, everywhere it is based, an anchor for AKP", the party of Turkey's president, Recep Tayip Erdogan. According to L'Express "many managers of PEJ are also in charge in Cojep". What is their program? The classic one for an Islamist party: abolishing the founding secularist law of 1905, which established the separation of church and state; veils mandatory for schoolgirls in public schools; halal food for all schools; support for Palestinians; and community solidarity (as opposed to individual rights) as a priority. All that is wrapped in the not-so-innocent flag of the necessity to "fight against Islamophobia", a concept invented to shut down the push-back of all people who might criticize Islam before they can even start. According to the magazine Marianne, Mine Gunbay, responsible for women's rights in the city council of Strasbourg, fearlessly and tirelessly denounced the metamorphosis of Strasbourg into "political laboratory of the AKP". Strasbourg is the city where Erdogan was authorized by former president Hollande to hold an electoral rally in October 2015. Legally. Another noteworthy Turkish move in France is the probable nomination of Ahmet Ogras, the representative of Turkish Islam in France, as next president of the Conseil français du culte musulman ("French Council of Muslim worship", CFCM). Ahmet Ogras is known for his good relationship with Erodgan's AKP party. CFCM is the legal structure built by French politicians to have a single Muslim talking-partner. Until now, all presidents of CFCM were of Algerian or Moroccan origin. In Austria, in 2016, "Turkish citizens" founded the New Movement for the Future (NBZ) party. The goal of the party is to give Turks a voice in politics across Austria. The NBZ Chairman, Adnan Dinçer, explained that the rise of extremist right-wing parties have caused them to work faster. "Political actors are making decisions about the minorities working here, but we are not involved in this decision-making mechanism," he said. The NBZ makes it clear that they support controversial Turkish President Recep Tayyip Erdogan and condemn the "Gülen movement", which the Turkish government claims carried out a coup attempt in July 2016. Denk, a party founded by Tunahan Kuzu and Selçuk Öztürk in March 2017, became the first-ever ethic minority party in the Dutch parliament. The party, apparently a mouthpiece for Turkish president Erdogan, won three seats in the recent election, which was focused on immigration. Party leader Tunahan Kuzu said: "This is the beginning of a new chapter in our history. The new Netherlands has given a vote in the House." The Muslim population of Bulgaria is made up of Turks (Sunni), some Shi'ites, Bulgarians and Roma, who together represent 7-8% of the total population. In Bulgaria, there are three Muslim political parties, in which most of the members are Turkish and Muslim. One of these parties is The Movement for Rights and Freedoms (HÖH), founded in 1990 by Ahmet Do?an. In 2014, HÖH was represented by 38 people in the 240-member parliament and had four MEPs in the European Parliament (EP). HÖH, which made a coalition with the Bulgarian Socialist Party (BSP), thus has a say in the country's administration, even though leadership changed after a 2013 assassination attempt against Do?an. Because Erdogan was not satisfied with HÖH, he has worked to create other pro-Turkish parties in Bulgaria. Many Germans of Turkish descent have chosen to invest in German established political parties and influence them from within. Some, however, are trying to influence policy from without. The Allianz Deutscher Demokraten ("Alliance of German Democrats", ADD) is a small party founded by Remzi Aru, evidently as a reaction to the German Parliament's recognition of the Armenian Genocide. ADD is friendly toward Erdogan and has been trying to establish an electoral base within immigrant and Muslim communities. Its leaders nevertheless had difficulty collecting the 1,000 signatures necessary to participate in the May 2017 North Rhine-Westphalia state election. Another Muslim-German party is the Bündnis für Innovation und Gerechtigkeit ("Alliance for Innovation and Justice", BIG), which has existed since 2010, but without much success. German law prohibits foreign funding of political parties, and a party of Turks would have to fulfill a certain range of obligations to get its certification as an official political party. "As soon as it bursts onto the political scene, the same consequences appear as in Algeria, Egypt, Pakistan, the Sahel or Tunisia: it divides the country between Eradicators (those who want to eradicate the Islamists) and Reconcilers (those who advocate dialogue with Islamist monologue) and the Fatalists (those who are waiting for something good to happen)." As a fine political analyst, Kamel Daoud knows -- and everybody knows with him -- that nobody in France has the solution to confront the Islamist problem. The only question is: who will win? Reconcilers or Eradicators? One thing is sure for now, Reconcilers are in power for the next five years. Another thing is sure: the first veiled woman elected as a Member of Parliament will trigger a civilizational that which has no equivalent in French history.